We’ve all been talked into ‘getting fit’ before because it is good for you and will make you feel better. Very true. But doing any sort of exercise and sporting activity should be approached with knowledge and preparation. After all, failure to warm-up properly is the most common cause of a sporting injury. Five to ten minutes is all it takes to gently stretch and lengthen your muscles so that they are ready to respond when you pick up the pace. This said, sports injuries can still happen and can affect anyone at any time, whether you are taking part in a physical, team activity or a non-contact sport. 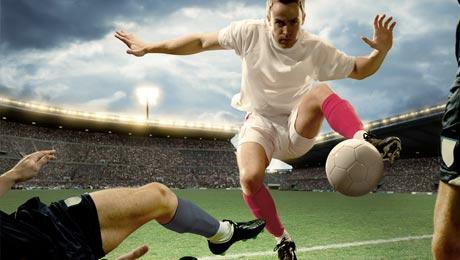 So with football and rugby seasons in full flow, what should you do if you fall foul of a sprain or dislocation on the pitch? In most cases ‘the early bird gets the worm’ is fitting, with the emphasis on getting prompt treatment. A sprain or a dislocation can take anything from one week to several weeks before you see a full recovery, but speedy intervention from a healthcare professional can make all the difference. An early, accurate assessment can deliver a prompt diagnosis and define the seriousness of your injury. In some cases, this early analysis will include an x-ray or even an MRI scan to help pinpoint the exact location of your injury and identify the cause of pain. Your treatment plan can then begin straight away. Delayed treatment for injuries usually means a longer healing time and a greater chance of recurrence, leaving you with abnormal scar tissue, joint stiffness and muscle weakness. Wearing the correct protective equipment is also vital. Shin pads, boxing gloves and cycling helmets, for example, play a vital role in protecting the most vulnerable parts of your body as well as reducing the likelihood of injury from impact. Impact injuries are the most common types of sporting injuries and occur as a result of your body unexpectedly moving, twisting or jerking in an unnatural way upon hard impact. Common impact injuries include dislocated joints, ligament and tendon damage, fractures and spinal injuries. Although spinal injuries are an uncommon outcome of sport participation, they are not unheard of. This is particularly true for sports such as martial arts or horse riding where the likelihood of impact is quite high. The consequences of a spinal injury can be life-changing and should be treated immediately. As with a sprain or dislocation, the time between the injury occurring and the treatment commencing has a direct impact on the long term prognosis. For a spinal injury, you may be offered a non-surgical, minimally invasive, form of treatment such as a steroid injection. This would not only provide instant pain relief, but also act as a diagnostic tool to help identify the source of pain. Imaging studies, such as an MRI scan can also form part of the diagnostics process giving the most detailed pathology of the area in question. It goes without saying that, once you are undergoing treatment for a sporting injury, you will need to refrain from the activity until the injury has healed. Continuing to aggravate the source is counter-productive and the injuries, and pain you suffer, in the long-term will be far greater than the complaint you started with. It could quite easily lead to a more serious condition or even an acute injury causing your bones to crack, muscles to tear or ligaments to snap. Don’t underestimate the importance of diagnosing the problem and starting treatment as soon as possible. The quicker you treat the issue, the more straightforward your treatment plan is likely to be meaning your recovery should be uncomplicated and successful. And if you’re already suffering from an injury that’s causing you pain and discomfort and stopping you from getting back to doing what you love, then why not make an appointment at the clinic? Based in Peterborough city centre, Avicenna Clinic is an independent, consultant-led private healthcare practice offering personalised health care to self-pay and insured patients. You can often make a same day appointment, see a consultant, begin diagnostics and receive a treatment plan all in a single visit – getting you back to what you love doing as soon as possible.